For faiths and traditions across the world, the sun has been one of the most important deities since the beginning of civilizations. The sun has been revered in many forms and ways. The concept of sun worship is nearly as old as mankind itself. One interesting example of mass scale sun worship is the Chhath Puja, which is celebrated in large parts of north India. It's a festival where reverence is given to Surya Dev (the Sun God) and Chhathi Maa (the Dawn Goddess) in a unique way. 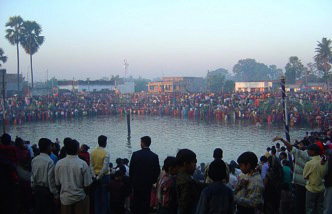 The rituals of Chhath Puja are extremely rigorous and include holy bathing, fasting and abstaining from drinking water, standing in water for long periods of time, and Arghya (offerings) to the setting and the rising sun. In this four-day-long festival, devotees show their gratitude to the sun god for energizing the world and sustaining life on earth. Although there is no authentic knowledge of when Chathh Puja was initially started, it is believed that it was celebrated even in the Vedic era. Rigveda has certain hymns of worshiping the Sun which describes similar rituals as that of Chhath Puja. Even in Mahābhārata, Draupadi is depicted as following similar kinds of rituals. The first day of Chhath Puja is called Nahay Khay. The ladies observing the ritual are called Vratin and they take only one meal on this day. The second day is called Kharna when fast is kept for the whole day, which ends in the evening shortly after sunset. The most rigorous phase of Chhath Puja starts when Vratins go on a fast without water for 36 hours. On the third day, the entire household accompanies the Vratins to a riverbank or water source to make the offerings (Arghya) to the setting sun. The folk songs are sung on the riverbank on the evening of Chhath. On the final day of Chhath Puja, the devotees, along with their family and friends, go to the riverbank before sunrise, in order to make the offerings (Arghya) to the rising sun. The festival ends with the breaking of the fast by the Vratins. The interesting thing is that, instead of idol worship, in Chhath Puja, the visible and physical energy of the Sun is worshipped. It is believed that observing the rituals of Chathh helps the body for the absorption of cosmic energy, giving us strength to fight many diseases. 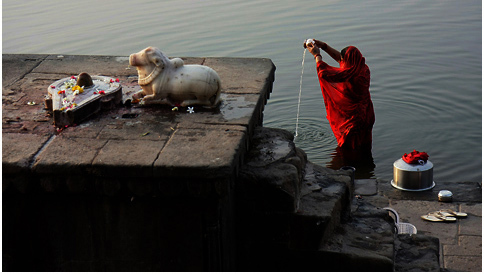 Chathh Puja is the realization of the supreme energy that the sun bestows upon us.